More than 250 people turned out today for the funeral of Hutch associate Jason ‘Buda’ Molyneaux in the North inner city. Jason 'Buda' Molyneaux (26) was shot six times in an attack at James Larkin House in the North Strand area of Dublin on January 30. Molyneaux was hit four times in the chest and twice in the stomach by a lone gunman. At his funeral today, Molyneaux’s partner of ten years Nicole was among those who brought up the offertory of gifts to the altar. They included his motorbike helmet, his phone and a bottle of his favourite aftershave. 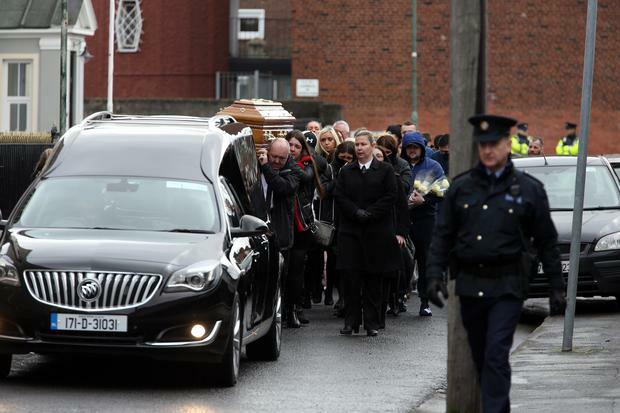 His white rose draped coffin was then carried into the church by loved ones, with numerous uniformed Gardai and members of the Armed Support Unit visibly present in several areas outside. Fr Brendan said people were “shocked and horrified” at Molyneaux’s killing. He pointed out how he was baptised and made his confirmation in the same church where his funeral was now being held and that he would now be joining his departed father Gerry. He added that he was “a great character, who loved a joke”.